Around 1980 I went to work for the US federal government, the US Forest Service to be specific. I was then a libertarian economist (Austrian School). Many people I knew were puzzled as to why I chose the Forest Service over private industry. The answer was simple and personal: I believed then that the financial collapse that happened in 2007 (or 2001 depending on perspective) was imminent. I also believed that the government might be a better safe-haven than private industry during a financial hurricane. And I loved the public lands, which was a chink in my libertarian armor. During my early years in the Forest Service I adjusted my ideology, drifting left. I was never a fan of government bureaucracy, but I came to view government as a necessary evil. Despite being embedded within bureaucracy I continued (and continue now in retirement) to rail against bureaucratic bungling (e.g. here, here, here). After thirty years studying markets and market mechanisms, I believe that capitalism (Wiki link) too is a necessary evil, at least for the foreseeable future. Capitalism is necessary because it is the best way to deliver the type and amount of "goods" people desire. It is evil because it is "cruel, unjust, and turbulent", as noted long ago by Joan Robinson. My dream is that someday (distant "Star Treck" future) we will be able to transcend capitalism, but that is only a dream. We would at minimum, have to find a means (read "incentives") to unleash the creative innovations that market mechanisms now unleash, and to transfer effective "price signals" and other signals that market mechanism now transfer when markets function effectively. I also believe both government and markets to be necessary and good. That is, when functioning well they both serve necessary functions in society. But both government and capitalism tend toward abuses of power, sometimes intertwined, that lead to evil. This is particularly true when we fail to recognize this tendency. Crony capitalism (Wiki link) is only one of these. Our challenge is to find means to thwart evil tendencies in both government and capitalism, and to find means to enhance the good in each — in both. Our challenge it to quit thinking "either, or" and start to face the reality of "both, and". 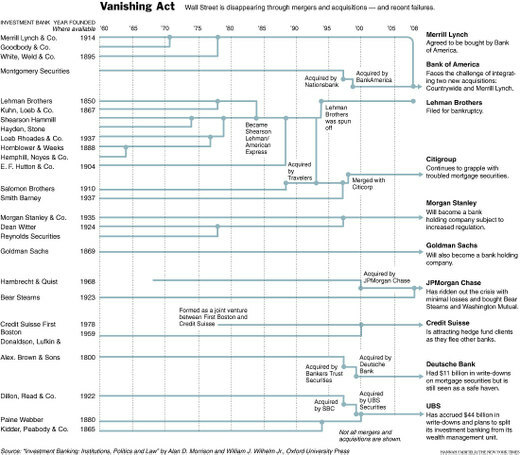 From NY Times, here is a handy-dandy guide to who gobbled up whom on Wall Street through the last 30 years. Note how many who have failed recently we're established long ago. Names like Merrill Lynch, Bear Stearns, Saloman Brother, Smith Barney. Long live Goldman Sachs! … Soros blames what he calls a "super-bubble" that started about 25 years ago. That's when a less-is-more philosophy became popular with economic regulators. That allowed Wall Street to invest increasing amounts of money in credit. Soros says there's a "super-bubble" in the economy that's bigger than just the recent housing crises, and he blames exotic financial instruments for helping cause it. "The markets have introduced financial instruments with fancy names — CDOs and CLOs and all these strange instruments that are traded in very large volumes. And they were all constructed on the belief deviations are random. A New Paradigm for Financial Markets, Introduction, George Soros: We are in the midst of the worst financial crisis since the 1930s. In some ways it resembles other crises that have occurred in the last twenty-five years, but there is a profound difference: the current crisis marks the end of an era of credit expansion based on the dollar as the international reserve currency. The periodic crises were part of a larger boom-bust process; the current crisis is the culmination of a super-boom that has lasted for more than twenty-five years. To understand what is going on we need a new paradigm. The currently prevailing paradigm, namely that financial markets tend towards equilibrium, is both false and misleading; our current troubles can be largely attributed to the fact that the international financial system has been developed on the basis of that paradigm. Grizzly Bears roam the financial landscape: Doug Noland and Michael Shedlock here (or here) are ever-bearish, but so is Barry Ritholtz (Forbes video link). The "D" word is uttered ever-more-frequently. Yet I find myself thinking that just beyond this likely deep recession we are at the leading edge of a reformation: re-forming financial institutions—private and government—and bringing US and other banking "kicking and screaming" into the 21st Century. In this I share hopes with Brad DeLong, Paul McCulley, Robert Shiller, and George Soros (or better still watch Soros: via the Financial Times in extended post). No one who is awake believes we will escape our current moment without at minimum a deep, prolonged recession. But some observers, like those just mentioned are less cynical than are they who believe that we are predestined to once-again repeat the tragedies of the recent past and earlier times—in particular to continue to reward speculative excess. It is by no means certain that we will indeed reregulate our system to once-again disallow the worst excesses of extended bouts of irrational exuberance and the irrational pessimism that must follow. But we might. We must! I've hoped for reforms too often in the past and been disappointed, but signs of hope are on the horizon at a time when moderates are beginning to take the reins of power in the US Congress away from borrow-and-spend neoCons on the far right and traditional tax-and-spend Democrats on the far left. Let's not be eager to blame the Federal Reserve, the Treasury, and the SEC for this mess. NeoCons and "free market fundamentalism" are better targets for blame. And let's not forget that there was good reason for bringing the Federal Reserve system into being long ago—to curb the excesses of "boom and bust" cycles. The system worked reasonably well after the late 20s, early 30s debacle to disallow Hyman Minsky’s PONZI FINANCE moments. That is, it worked well until the so-called "Republican Revolution" dismantled regulatory functions of government here in the US. I'm not naïve enough to believe that we could have weathered the storms brought about by recent financial and technological innovations without some pain, but the real tragedy I see is that "we the people" of the USA haven't yet figured out that we need good government to accompany good markets—and that neither can work effectively in isolation or without continued vigilance and oversight from citizens and the press (now fortified with internet commentary). Government agencies and institutions must begin to wake up to realities that W. Edwards Deming, Peter Drucker, and many newer management writers have helped the best of our private-sector entities understand—that innovation and quality reform must be institutionalized into the fabric of agencies and institutions, to be ongoing and ever-vigilant of changes in external environment that must be incorporated into internal corporate and government cultures. Let's hope wider government reform begins with the Fed, the SEC, and the Treasury. the potential for real problems, gaius marius, Decline and Fall of Western Civilization, March 14: there's a canard in american political history that herbert hoover did nothing to alleviate the onset of the depression. such was the angle of attack from franklin roosevelt in 1932, and so successful was that campaign that its propaganda became embedded in american mythology. it's not so, of course -- hoover was a very activist commerce secretary who took an active role in creating the credit excesses of the 1920s, and then an even greater activist stance in forestalling the bust. the new deal was his deal, by and large, carried out in grand scale by roosevelt as the depression wore on. one can argue about the wisdom of government intervention in the aftermath of the bubble bursting, of course. but the original sin is in the creation of the bubble -- something that can only be done with government at minimum standing aside from its natural regulatory role, and indeed in this case was facilitated by manipulation of interest rates and the underwriting of massive credit backstops in the form of the GSEs. many american conservatives are so totally divorced from reality on the issue so as to be dangerous. they generally have encouraged all manner of government facilitation of the credit bubble under the bush administration since 2000, but there remains underneath an ideological and utopian desire for non-interference. and now that long-building problems which arose with government complicity are surfacing, the animal desire to flee the problem (and all responsibility for creating it) is also surfacing -- in the form of belated laissez-faire. moral hazard aside, an honest history of capitalism will reveal that every major crack-up since the tulip mania of the 1620s was addressed with government-taxpayer bailouts on some level. it is part of capitalism to do so -- the losses, once too great, are socialized, and this is the price paid for the long-term benefits of price-driven resource allocation. that this fact isn't part of the ideological mantra of capitalism as defined by the zealots and high priests is as meaningless as the fact that the doctors and philosophers of communism were disappointed by the impurity of the system in practice. and it is very important for in situ leadership to understand that ideological purity is a noose by which they will be hung if they insist. what has happened in the united states is not good, but it is probably manageable IF government recapitalization of the banking system gets underway. however, the sort of public denial of deep-seated problems at the heart of the system that our executive leadership is apparently willing to forward -- beyond being yet another dimwitted escapade of a kind with that which led them to eschew the "reality-based community" over iraq -- can have massive ramifications if it results even in just a significant delay of action. once a deflationary credit unwind gets underway, it can be extremely difficult to stop. the key will be to support the banks well before that happens, and then to move into the credit markets with a measure of regulatory zeal longer-term to prevent the kind of credit underwriting lapses that characterized 2002-2007.
it seems almost comic that the tragic administration of george w. bush -- unsatisfied with trashing american soft power and cultural advantage, unsatisfied with plunging this nation into a fiscal and military morass in the middle east, unsatisfied with widening and hardening virtually every division in the american political landscape -- would take its infamous conflation of raging incompetence and ideological zeal to the final length of sealing the american economy in a tomb. and yet it might. if the administration draws a line against government recapitalization and tries to defend it, it will actually become what roosevelt once only painted the adminstration of herbert hoover as. and that would have the potential for real problems. Lingering question: Did Herbert Hoover get a "bad rap" re: The Great Depression? That is, is Marius correct in this assertion: "hoover was a very activist commerce secretary who took an active role in creating the credit excesses of the 1920s, and then an even greater activist stance in forestalling the bust. the new deal was his deal, by and large"? See, by contrast, The Ordeal of Herbert Hoover. Misunderstanding the economy's weakness earlier this month is trivial compared to the much more grandiose mistake of failing to recognize the $8 trillion housing bubble, or before that, a $10 trillion stock bubble. If performance mattered, then the experts who got things so hugely wrong would no longer be the ones shaping public policy. Instead, with the Washington Post style beautification process, experts can jump from policy disaster to policy disaster and never have their failures affect their standing. If we are ever to have an open debate on economics, or any other area of public policy, we will need media that honestly discuss policy failures and that hold those in charge accountable. In the current situation, the economic disaster facing the economy was entirely preventable, but the Federal Reserve and the rest of the inside crew were either too incompetent to recognize the housing bubble or felt the short-term benefits outweighed the costs that the country would inevitably face when the bubble burst. … [Most] major news outlets chose to hide any serious debate on the problems posed by the bubble on the way up, and they would like to prevent any discussion of this massive policy failure even in retrospect. The Real Recession Problem: Consumers Are at the End of Their Ropes, Robert Reich, Jan. 28: … [Business tax breaks exemplify] the illogic of what’s called supply-side economics. If you reduce the cost of investing, so the thinking goes, you’ll get more investment. What’s left out is the demand side of the equation. Without consumers who want to buy a product, there's no point in making it, regardless of how many tax breaks go into it. Which gets us to the real problem. Most consumers are at the end of their ropes and can't buy more. Real incomes are no higher than they were in 2000, while food and energy and health care costs are all rising faster than inflation. And home values are dropping, which means an end to home equity loans and refinancing. Most of what's being earned in America is going to the richest 5 percent, but the rich devote a smaller percent of their earnings to buying things than the rest of us because, after all, they’re rich — which means they already have most of what they want. Instead of buying, the rich invest most of their earnings wherever around the world they can get the highest return. Add all this together and there's just not enough consumer demand out there to keep the American economy going. We're finally reaping the whirlwind of widening inequality and ever more concentrated wealth. Supply-siders who want to cut taxes on corporations and the rich just don’t get it. Neither does most of official Washington. Obituary: Conservative Economic Policy, Jared Bernstein, TPM Café, Oct 19: Conservative economic policy is dead. It committed suicide. Its allegiance to market solutions, tax cuts and spending cuts, supply-side nonsense, manipulative and corrosive ties to industry and the rich, have left it wholly unable to cope with the challenges we face. Its terribly limited toolbox simply cannot address the economic insecurities and opportunities generated by today's global, interconnected, polluted, insecure, dynamic, bubble-prone economy. What's more, progressives have developed an alternative policy set with the flexibility to combine market forces with the necessary regulation and redistribution to address these challenges. Whether that agenda will ever see the light of day is another question. … The fundamental flaw with conservative economic policy is its reliance on markets for problems that markets can’t solve. It is widely recognized, for example, that consumer-driven health care … does not begin to address the challenge of health care reform. Similarly, while we can all agree that globalization has many positive attributes, simply calling for more "free trade" doesn't address either pervasive income losses to many Americans or the unfulfilled promise of trade to the poor in developing countries. A related flaw is the inability of the empty conservative toolbox to deal with the critical economic questions of the day. How much regulation is necessary to both foster growth and innovation while avoiding the rampant speculation that has infected key sectors, such and housing and financial markets? The conservative answer is "none," and that's obviously wrong. The last two economic recoveries have been crippled by bursting speculative bubbles. But the trick, of course, is correctly calibrating the regulatory agenda. On inequality, … [There is] nothing in [conservative ideology's] toolbox to address inequality. To the contrary, their tax policies exacerbate it. And while education provides a critical leg up, it cannot be the sole policy solution for inequality …. When the benefits of (accelerated) productivity growth are flowing almost exclusively to a narrow sliver at the very top of the wealth scale, something else besides "enhanced returns to skills" is going on. … Too much power rests in the hands of too few right now, and they have used their political and financial power to pursue violent, shortsighted foreign policy, steer the lion's share of growth their way, and avoid dealing with the challenges of global warming, health care, and inequality. So we are left with a riddle: how can conservative, economic elites be both powerful and dead at the same time? In my decades of life as a progressive economist, I've never seen such an outpouring of good ideas. … But good policy solutions by themselves won’t win the day. I remain deeply nervous that progressives will fail to tap this uniquely clear moment of the failure of conservative policy. And the stakes are very high. If we squander this opportunity—if we fail to get the majority of the electorate behind the progressive ideas touted above, or we fail to push wavering centrist democrats toward these ideas—we may not be able to repair the damage. I don't mean to be alarmist, but we must stop the zombies before it's too late.